The unique benefit of obtaining your diagnosis in the privacy of your own home however has the potential to have the validity of the outcome called into question unless you can prove that you were actually the patient being tested. To address this issue, the Watch-PAT has a patented UNIQUE CHAIN OF CUSTODY capability, that when applied and documented by a third party will ensure that the results - particularly if Negative - are recognized and considered valid. Only the Watch-PAT 200 combines the simplicity of a Watch-like platform with an elegant solution to confirming your identify to ensure the results of your sleep study are considered legitimate. 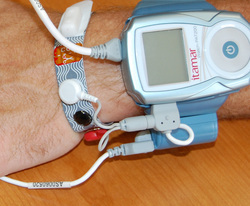 By connecting the short color-coded wires from the Wristband of the testing device to the ID Bracelet, the circuit will be established that allows the WatchPAT to operate. Being sequenced to each other when configured at our facility, the two elements must be connected in order to activate the test. Typically only required/suggested upon a Negative Test outcome. The optional Chain of Custody bracelet is also uniquely available with the Watch-PAT to ensure data validity for patients that test Negative for OSA when using the Watch-PAT. As the validity of Negative Results can be suspect as the possibility of having someone else use the diagnostic system while being used Unattended, the Watch-PAT has an optional capability to be linked with a Positive ID Bracelet to remove any question as to patient compliance and proper use. As this option requires an additional step to have the Prescribing Physician or a Notary Public apply, or at least attest to the proper application of the ID Bracelet, it is typically only employed if the initial Watch-PAT Study is returned and records a NEGATIVE result (no OSA). An opportunity to participate in a second study, AT NO ADDITIONAL COST, will provide both the Chain of Custody feature as well as another night's Sleep Assessment to ensure the data is representative of your symptoms, as variations in nightly sleep do occur. The ID bracelet is applied, or confirmed applied, by an authority figure that attests to the individuals identity and signs an affadavit. The patient is then free to wear the non-removable bracelet until the time of the study whereupon the Watch-PAT will only function when connected to the ID bracelet. The bracelet is removed (by scissors) along with the test device and returned the following morning. Through this capability, the validity of the results specific to each patient can be confirmed for your Medical Examiner or Employer. You may elect to proceed without the Chain of Custody feature at the time of ordering the service, but recognize that if the results illustrate you DO NOT have Sleep Apnea, the results may be considered suspect if the proof of identity is not coordinated. Click here to review the ID Bracelet Instructions For Use for the Chain of Custody feature of the WatchPAT 200.